Google maps pranked my bike route up Mt. Diablo! In lieu of the usual map view, I got Dragon Quest. Pedaling up Diablo, I pondered, what is it about 8-bit that puts a flutter in my analog heart? The rain freshened pastures on Diablo’s lower flanks were brilliant, Emerald City green. Could it be the 8-bit color scheme that attracts me? I do love it bright — yellow bike shorts, hot pink arm warmers bright. Next time, I’ll throw on Dorothy’s ruby bike shoes for a full Technicolor effect. Diablo’s vivid cow pastures soon gave way to a mottled hillside of pines and chaparral. Many a Tang scholar found inspiration in wind-gnarled pines. At 1800 ft, I passed into a knoll of knobcone pines and — thank my scholarly ancestors — became a bit more philosophical. 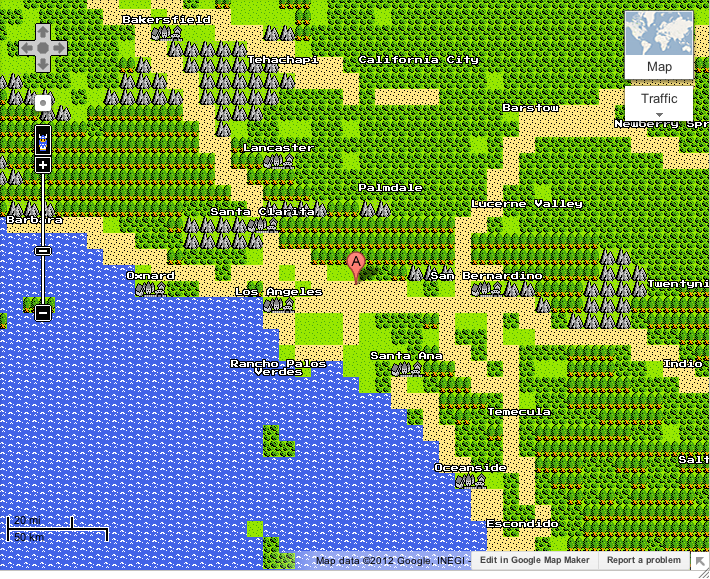 8-bit Google Map is more than a nostalgic novelty. It is also a novel mapping of our everyday landscapes. It transposes a fictional, Nintendo landscape aesthetic onto Google’s standard and equally fictional mapping. Consider the standard Google map view. In this visual language, human sprawl is taken for granted. Rendered in neutral gray, highways, suburbs, and mini-malls slyly evade us, slipping into the background. By contrast, the fragmented green of our remaining wild-lands interrupts and intrudes upon the negative space of sprawl. The visual language of maps facilitates how we view and explore our world. The standard Google map rendering belies that sprawl is the invader. Equally, drawing blocky boundaries on green space does not fence in the deer and the coyotes, the thistles and the oaks. The Zelda-esque Walnut Creek is an alternate reality. For a kid of the 90’s, an 8-bit aesthetic is THE ORIGINAL visual language of questing and adventure. 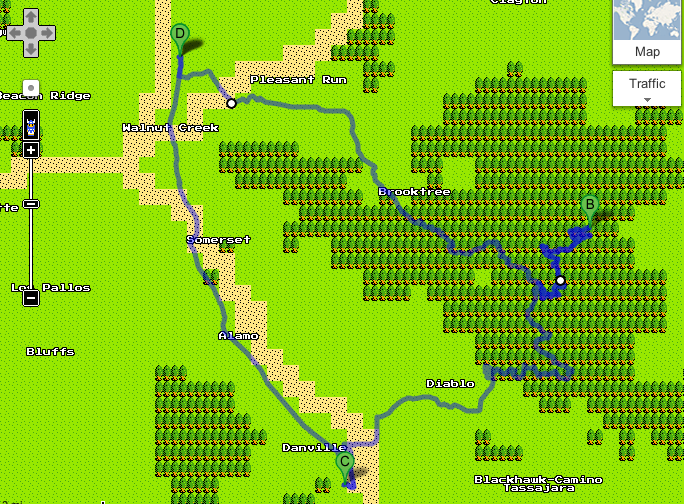 In 8-bit Google Maps, we find cart roads instead of highways, lime-green meadows in place of urbanity. One expects not Burger King and Dairy Queens, but menacing marauders and maybe even treasure. The 8-bit generation for whom Zelda Google Map is most understandable grew up urban, car bound and maybe just a bit lost to the world. I know. I was a latch-key kid in SoCal who didn’t walk or bike but drove 2 miles home from school. TV was my babysitter and thumbing a Gameboy my idea of adventure. Here’s a screen capture of my hometown as Google sees it on April Fool’s. Visually prominent are the sites of my first ventures into backroads and highcountry peak bagging — the San Gabriel and San Bernadino Mountains. 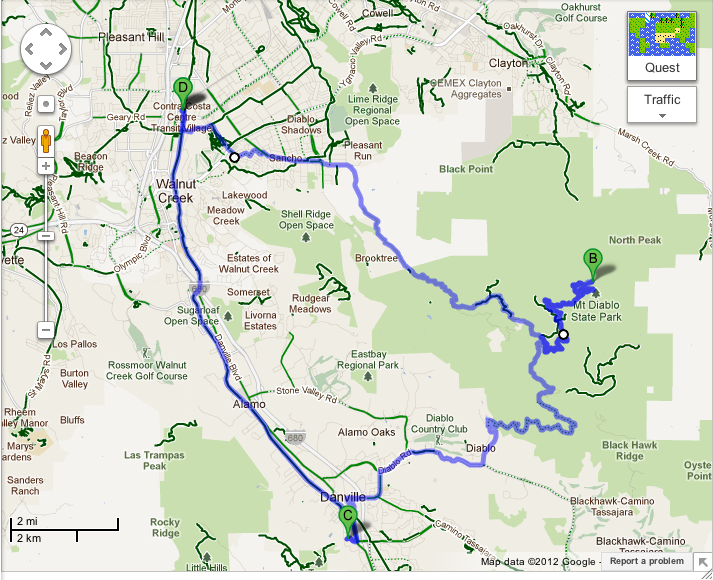 8-bit Google Map tells us to forget the sprawl and look to the peaks and piney woods in our backyards. For the 8-bit generation, this is the visual language to inspire analog adventure. Continue reading: Legend of Zelda: Quest for El Diablo. I also love that Koryo Sushi is the other significant landmark of your 8-bit neighborhood!